Beef is a staple of British cuisine. We all know our roast beef, steak and kebabs, but there's much more than that to beef and a huge range of ways of cooking it, from fancy dishes to quick meals, hot or cold dishes, thick steaks or thin slices. See all our beef recipes here. Beef is an excellent source of protein. It contains less than 6% fat, more than 22 amino acids (including 8 essential acids), iron, zinc and B vitamins. The human body cannot produce these, and has to take them from food. 100g beef provides 35-45% of the recommended daily requirements for a man weighing 70kg, and 40-50% of the needs of a woman weighing 60kg. Beef contains bad cholesterol, so it shouldn't be eaten too often. However, if you cut beef out of your diet you could suffer from anaemia. If you're on a diet, you shouldn't cut beef out by any means: it fills you up, for one thing. Despite what you might think, meat-based stews are perfect slimming dishes (the vegetables capture all the fat), as is grilled beef. Just don't have too much of them! How do you tell when a piece of beef is fresh and how should it be kept? There are three categories used to determine the quality of beef, according to its origin, age, the animal, the way it was butchered, the colour and fineness of the meat's grain. Good quality meat is bright red, shiny, firm and elastic. We say it is 'marbled' when the meat has fine veins of fat running through it (but not too many!). Read the label for information about your beef. Protected Designation of Origin beef brands in the UK are Scotch, Welsh and Orkney. 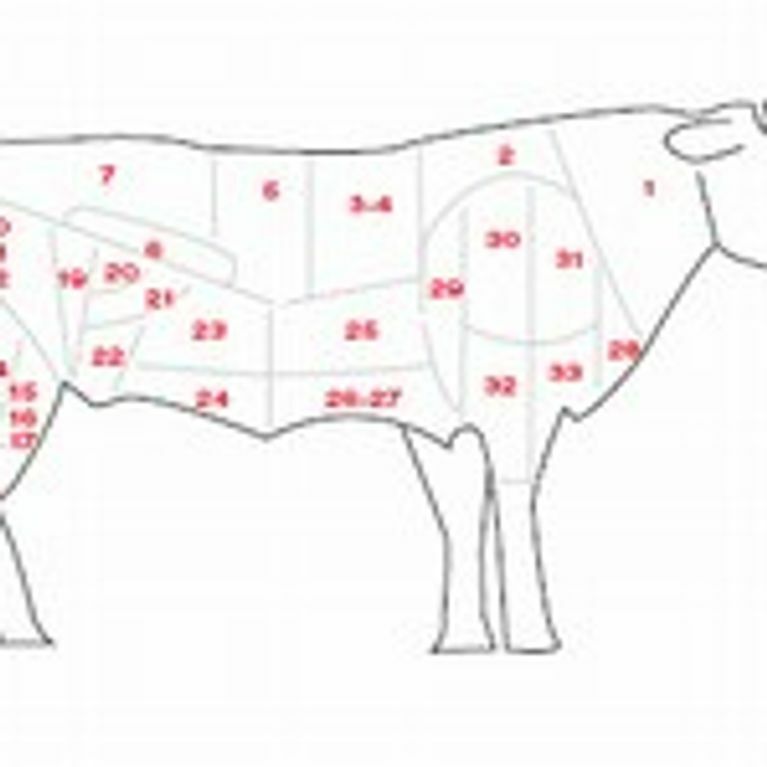 Rump and loin, fore/standing rib, thick skirt, thin flank, middle rib, tenderloin (chateaubriand), rump, loin, round. 1-15 minutes (15 for ribs) on each side. 15 minutes per pound (1 pound = 500g) in the oven. Fore shin, chuck, short ribs/plate, forequarter flank, shoulder/blade clod. 4 hours slow cooking on a gentle heat. 5 minutes under the grill or BBQ. Shoulder/blade clod, shank/shin, brisket, fore shin, tongue, neck/clod and sticking, chuck and blade, forequarter flank, cheek. 3 hours slow cooking over a gentle heat. Make sure you keep beef properly! Meat should be cooked or refrigerated quickly, never in foil or an airtight container. Butcher's paper is the best thing to keep beef in. In the microwave: use the defrost function, but don't leave meat on defrost for too long (around 8 minutes is enough for 2 steaks). After taking it out, set the meat aside for 10 minutes before cooking it, so that it doesn't go like cardboard. - Raw beef (carpaccio or tartare) goes well with light French reds like Bourgogne, Loire Valley reds or Pinot Noir. - Grilled beef goes well with Bordeaux, which is more tannic. - Roast or slow-cooked: Spicy, full-bodied reds. - If you've used wine to make stews, casseroles etc, serve the same one at the table. You can also use white, for a change! - Beef cooked straight out of the fridge will be hard. Take it out and leave it to cool at room temperature for a bit. - The thicker the cut of meat, the higher your grill needs to be. - Never pierce meat before grilling. This can dry it out. - Season mid-way through cooking so the meat doesn't lose its moisture and softness. - Mix different cuts of beef in stews, casseroles and hotpots for extra taste. - If you're cooking rare meat, wrap it in aluminum foil and put it at the front of the oven for a few minutes so that the heat gets right to the heart of the meat. This way, if you like your meat bloody it will still be hot on the inside. This works well for steak, too.